If one guy is the generator (or even, permission-giver) for all new ideas/visions, then the church is in for some very slow growth. If relationships and honour are valued above creative aspirations then there is safe ground for multiple visionaries to express themselves. 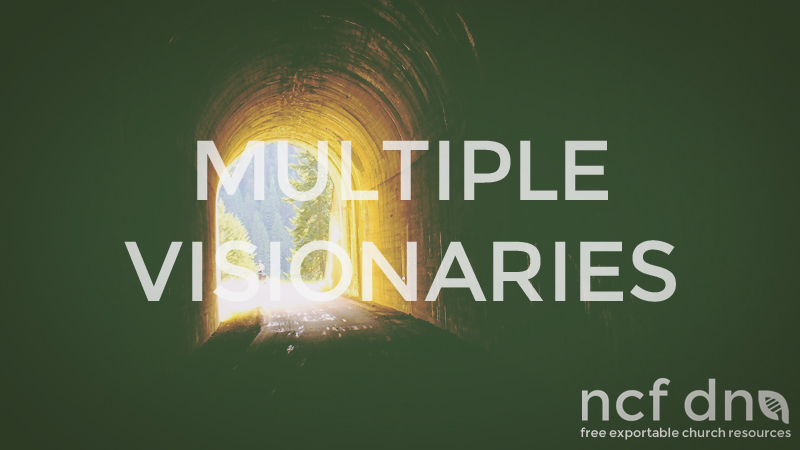 If there is sufficient humility for team players to switch roles from “visionaries” to ” activators of other peoples visions then multiple visionaries are possible. 1. A visionary needs to have an inspired destination. To know where you are going needs an appreciation of the alternative routes. To know where you are going needs research & understanding. That might entail talking to lots of people, reminding yourself of prophecies God has spoken, reminding yourself of similar situations and lessons from your past. To know where you are going requires revelation from God. You need to know that God backs you. You need to hear from God through prayer, prophecy, his word and the testimony of the Holy Spirit. Go where they ordinarily wouldn’t go left to their own devices. It includes the painting of a dream. Be positive- say YES WE CAN by instinct, then problem solve after. Learn to love problems as a means to glorify God. Ensure that you meet he deadlines and promises you made. Be courageous. That does not mean beating your chest, it means overcoming intimidation and fear and smallness in any form. Spend one on one time with them. You don’t lead ” generals ” by remote control.